For the first time since 2013, Bark has filed a lawsuit against Mt. Hood National Forest in federal court. 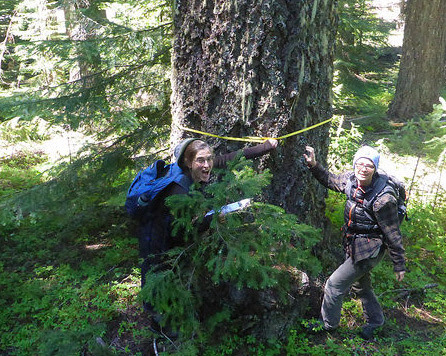 On Monday, Bark, together with Cascadia Wildlands, WildEarth Guardians and Oregon Wild, challenged the Crystal Clear Restoration Project which is slated to log almost 12,000 acres and build 36 miles of road on the eastern slope of Mt. Hood National Forest. I am joined by Jennifer Schwartz & Nick Cady as attorneys on this case. Over the past five years, Bark has engaged in the collaborative process to work through disagreements with the Forest Service and timber industry – with some degree of success. We’ve invested significant time and energy into building relationships with other stakeholders on the Forest to seek places of common agreement. However, the Forest Service decided to not engage the Wasco County Collaborative Group in planning the Crystal Clear Restoration Project, which resulted in this highly controversial project. As the climate crisis grows worse, it is essential that carbon emissions from logging be fully analyzed, as well as the lost carbon sequestration from such logging. The Environmental Analysis for Crystal Clear did neither. Given the Forest Service’s refusal to collaborate or change the project to resolve 15 pre-decisional objections, Bark had no option but to challenge the project in court. While Sec. Zinke’s rant has been thoroughly debunked by forest ecologists, this divisive rhetoric is also completely out of touch with what actually drives groups like Bark into court. It is absurd for Secretary Zinke to accuse groups like Bark of wanting communities to burn up! This lawsuit does not challenge the aspects of Crystal Clear that are designed to restore forests that have departed from historical conditions and/or natural fire regimes, includes thinning saplings and thinning in plantations. However, as all the plaintiffs in this lawsuit have told the Forest Service for the past two years – fire is part of the natural cycle of the forest; don’t use the fear of fire to justify logging in healthy mature forests legally required to be managed for old-growth species! We are confident that science and logic support our legal claims, and hope the federal court judge is not swayed by the fear-based rhetoric coming from politicians and the timber industry. Thanks for your ongoing support as we step back into court – and may the forest be with you! P.S. Bark is hiring for three positions - check it out!